The Written Years has been six years in the making and if it’s anything to go by it appears that those six years have been well spent, because the Vancouver based band’s debut is a gorgeously composed collection of tracks reflecting the year’s coldest season. The Written Years themselves describe their self-titled record as ‘winter music’, and it’s easy enough to see why as it brilliantly conveys the nostalgia that only icy mornings and falling snow can. The Written Years falls somewhere between Transatlanticism-era Death Cab For Cutie, Young Statues and Bon Iver, offering up touching, emotional and well penned songs covering the themes of affection, belonging, loss and nostalgia in welcome abundance. As a result the record brings about the shivers and goosebumps that only music and cold weather can, by pairing excellent lyrics with striking, textured instrumentals. The Written Years is ambient indie-rock done brilliantly, seeming to cruise from start to finish without pushing too far towards either end of the emotional spectrum. The band find a comfortable balance between the euphoric and the depressing by nestling their music somewhere in the middle and it makes for a record that affects a listener without necessarily forcing them to feel. Opener It’s Not Your Fault sets the tone sublimely, beginning with a hazy intro and then blossoming into life amidst upbeat instrumentals before dropping off for a relaxed verse as vocalist Wade Ouellet gives a listener the first taste of his passionate and humbling delivery. There’s a distinct charm to Ouellet’s vocals that perfectly complements music of this nature, and the same can be said about Kodie Krogh’s melodic guitar work and Kane Enders drumming and percussion. Each artist seems to understand what they’re going for and The Written Years is majestically constructed, with each member contributing something that adds immensely, making the record one that has heart and allowing it to communicate with a listener much more effectively. Excellent production helps, with a number of layers and extra instruments providing dynamic yet melancholic backdrops, be it on the bleaker The Phone Is Ringing or the quirky I Would Miss My Home If Knew Where It Was, which is much more upbeat than its The Smiths styled title suggests. There’s a comforting glow to each track on The Written Years, and fifth song You’re Too Kind offers a more positive perspective, with clever drumming and optimistic lyrics as Ouellet sings ‘I guess I can if there’s someone you love / as long as you can be happy’ over chiming guitars. Although a few tracks offer brief glimpses of sunlight amidst wintry clouds Homesick Dirge paints pictures of endless snow and the emotional isolation that comes with it (‘It’s cold in this house with the snow piled to the roof / We’ve been frozen inside for years / We still sleep in our separate rooms), making for an inspired and emotional listen. 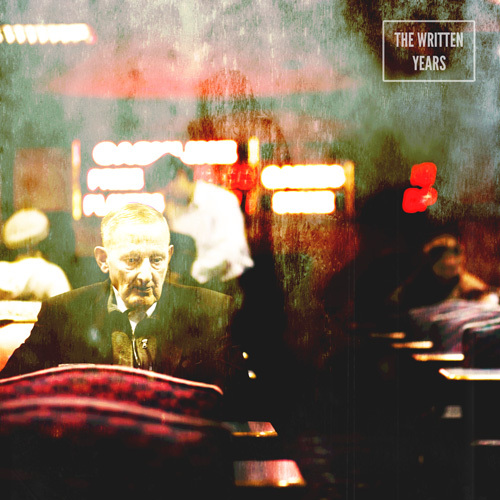 The Written Years’ lyrics are one of the records many strong points, and on tracks like this one and closer The Station the band excel, spinning reflective stories in a way that matches the season they take place in. Their debut is a rare sort of record in that it manages to capture regret and loss and pair them with a soundscape that matches, like for like. For Emma, Forever Ago did the same in 2007 but The Written Years’ use of polished instrumentals and higher production values makes for a warmer take on colder stories. I cite Bon Iver because I can’t remember a record in recent memory that embodies a season and the moods that come with it as well as The Written Years does. Sixth track Hospital Rooms is another jaunty addition and another of the records best, allowing itself to coast along on tip-toeing melodic guitars, bringing in the records most aggressive and harrowing vocals in the final minute before sauntering to a close in fine fashion. At eight tracks and 38 minutes long The Written Years is fairly expansive, with most songs surpassing the four minute mark, allowing for a good amount of exploration as the songs often begin fairly subtle and then build layer by layer, as Are You Okay? does immaculately. Shortest and final track The Station closes out a very special record exceptionally, starting as a sombre acoustic number with Ouellet lamenting ‘So why won’t you stay here just one more day?’ as the song slowly unravels before ending abruptly. It’s the records mellowest track, and it leaves a listener wanting more, as any good release should. The main criticism I have of The Written Years is that most of the tracks end with ten to thirty seconds of studio noise or filler. It isn’t a big deal but it can occasionally stop the record from flowing in the way it perhaps should, although these respites do add a bit more charm and character – as do the bonus tracks a few variants have added on. These extra tracks consist solely of demos and acoustic versions, and it’s interesting to see how tracks like Homesick Dirge have developed from very little. New acoustic tracks Sur Eive and Theme Park Lullaby are suitably low-fi and fittingly rousing additions, especially the latter, which is very similar to the tracks that make up the standard record, both in sound and quality. Occasionally tracks do sound too similar and during the second half of The Written Years they run the risk of being overly familiar, but The Written Years find a formula and sound that works and for the most part they express themselves through it beautifully. The Written Years is a stellar record that breathes a bit of life into the year’s coldest months whilst still maintaining a relatively chilling lyrical core. It’s the perfect companion to a wintry day in that it’s cold enough to match the surroundings but burns bright enough to light them, be it during early morning drives or bitter walks beside a frozen canal. As the winter draws to a close there’s still plenty of time for The Written Years to accompany its final few weeks, especially seeing as it’s one of the best releases of 2014 so far, and probably still will be next winter. For a debut release it serves as a great introduction to a band who get almost everything right, and it’s recommended that you soak it in as much as you can before the season ends.